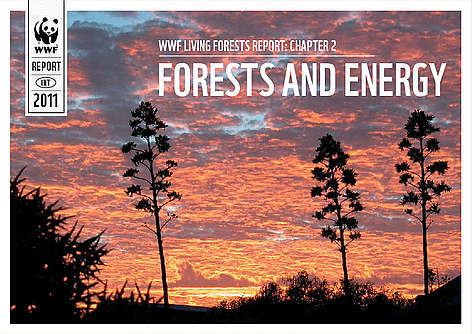 Cover of Living Forests Report, Chapter 2. Forests have provided us with wood for cooking and heating for thousands of years – but today the relationship between forests and energy is more critical than ever. Cheap, easily accessible fossil fuels are running out, and their use releases huge amounts of greenhouse gas into the atmosphere, driving climate change and acidifying oceans. WWF’s vision is that, by 2050, 100 per cent of the world’s energy will come from sustainable renewable sources – and bioenergy is likely to form a significant part of this. But there are risks: as the world’s population grows and competition for land becomes more acute, producing more bioenergy could increase food and water shortages, and destroy natural habitats. What social and environmental safeguards are needed to manage these risks? And can we produce more energy and still achieve WWF’s goal of no overall loss of forest area or forest quality – Zero Net Deforestation and Forest Degradation (ZNDD)? Bioenergy describes all energy derived from biomass (living or recently living material). The main sources of biomass are crops, natural forests and tree plantations. In the future, new technologies are likely to produce fuel from a wider range of materials, including algae. 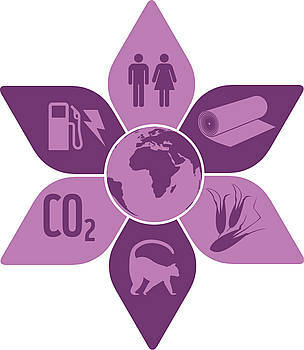 Worldwide, 2.6 billion people use traditional biomass, mainly wood and charcoal, for cooking. In recent years, industrialized countries have begun exploring new technologies that convert biomass into heat, electricity and liquid fuels (biofuels). Bioenergy can reduce greenhouse gas emissions because the carbon released can be recaptured during plant growth. But it may take decades for emissions from bioenergy to be absorbed, and converting carbon-rich ecosystems to bioenergy production could outweigh any climate benefits. Sugar and starch crops: sugarcane, sugar beet, corn, etc. Bioenergy FAQs: László Máthé, Bioenergy Coordinator at WWF International, answers some frequently asked questions about bioenergy. Living Forests Report, Chapter 3: "Forests & Climate"
The Living Forests Model, developed with the International Institute for Applied Systems Analysis, allows us to explore the implications of various land-use scenarios. We used the model to look at the potential impact of the large increase in bioenergy required by ambitious targets to reduce greenhouse gas emissions. Deforestation: It should still be possible to achieve WWF’s goal of ZNDD by 2020 while increasing bioenergy production, assuming ambitious climate change mitigation goals are the driving force behind bioenergy expansion. If bioenergy producers need to avoid land-use changes that cause increased greenhouse gas emissions, bioenergy should not become a major cause of forest loss. Forest management: To meet anticipated demand for wood, especially for bioenergy, the area of forest that is managed for timber production is projected to increase by over 300 million hectares between now and 2050. While this is preferable to deforestation, the impacts will largely depend on how closely the principles of sustainable forest management are followed. Tree plantations: Fast-growing tree plantations will continue to increase, largely to meet the demand for bioenergy: around 250 million hectares of new tree plantations are likely to be added between now and 2050. By 2050, the projected expansion rate may be more than 10 million hectares per year. Other natural ecosystems: As land competition becomes more acute, bioenergy will threaten other diverse natural ecosystems too, such as shrublands and grasslands. 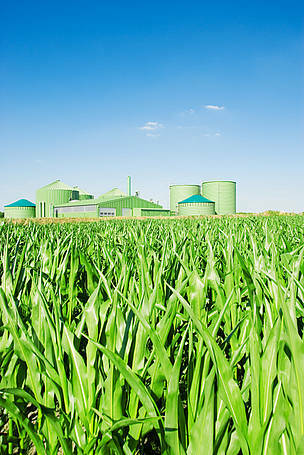 Growing demand for bioenergy could become the main driver behind their conversion. Food consumption and security: Increased demand for bioenergy could drive up food prices and threaten food security. But it is possible to meet the world’s food, fibre and energy needs while protecting forests if we move toward a global diet in which people in richer countries reduce calories from animal protein while people in poor countries increase them, improve agricultural efficiency and reduce food waste. Increased greenhouse gas emissions from deforestation and the energy needed to grow, refine and transport bioenergy. Researching new renewable energy technologies that require less land and water.